This beginning band method is designed to elevate the traditional goals of first-year students to new levels of achievement. Each lesson is skillfully presented in order to develop skills, creativity, and performance. 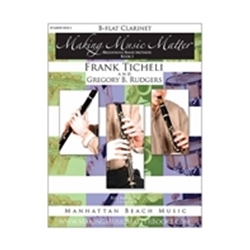 In addition to the exercises, warm-ups, and drills, there are 24 original works by Frank Ticheli as well as 15 solo pieces with optional piano accompaniment. Each composition offers a music-making opportunity based on band members' newly acquired skills. The ultimate goal is more than just learning to play an instrument, it's also to experience the joy of making music at the earliest stages of learning.